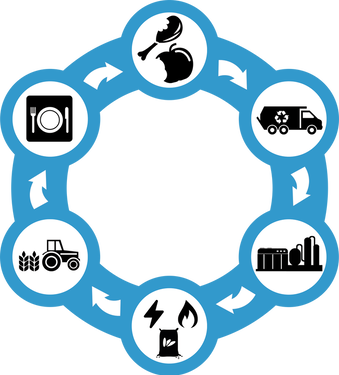 At Bio Collectors, we offer a true closed-loop solution by converting every bit of food waste we collect into electricity, biogas and nutrient rich fertiliser for farmers using our innovative Anaerobic Digestion (AD) process. Crews pick up your food waste using our specialist fleet of collection vehicles then deliver it to our AD plant in South London to begin the recycling process. The collected food waste is mechanically stripped of any packaging, plastic or other non-food waste contaminants. It is then broken down into small particles. The resulting food waste is pumped through a series of temperature controlled tanks and carefully monitored to ensure the bacteria has the optimal conditions to digest the food effectively. After 72 hours, the waste is ready to be used to generate electricity and Bio-Methane, which is filtered, screened for purity and finally fed back into the National Grid, helping to supply homes and businesses with clean, renewable energy. Once the potential energy has been released the leftover material is no longer waste but a useful, high quality fertiliser for farmers meeting the PAS110 standard. This helps them to produce more food and revitalise the land without the need for chemicals.